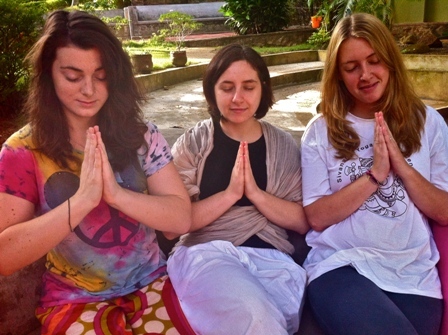 When I first arrived at the ashram, I was surprised and pleased by how social it was. Solo travellers had converged from across India and chatted in that eager way one does after a period of solitude. We had all arrived at the same time to commence a two-week “yoga vacation”. The director of the ashram had been quick to point out the dangers of focusing too much on the word “vacation”. Morning satsang (chanting and meditation) was compulsory, and a bell at 5.20am would ensure we got there by 6am. We would do four hours of yoga per day and attend evening satsang at 8pm. We would also complete our assigned karma yoga tasks (odd jobs like serving food, emptying bins, and cleaning bathrooms) every day. After the early wake up call, the first full day in the ashram felt impossibly long. It wasn’t hard really, but when the day starts before 6am there are so many hours following until bedtime. Amongst the new kids, a few were struggling. I watched their reactions with intrigue and developed theories about people, looking for patterns amongst those from the same countries or of similar ages. I noticed, for example, a tendency for the Australian guests to joke about everything – the schedule, the prayers, the food – but conduct their karma yoga duties with diligence and seriousness. I took this as an indicator of the Australian character, the larrikin with a strong work ethic. I also started noting down some of the more peculiar comments I heard from people who had freely chosen to stay in the ashram. I rarely weighed into these conversations, conscious that my endless string of self-righteous opinion might not be welcome, especially by those whose nerves were already frayed. I wondered why they came. I wondered why they stayed. I wondered why they were surprised by all the rules even though, on arrival, they had been handed a long list of rules to read with a dotted line on which to sign, declaring their acceptance. On the first evening, after we had meditated for 15 minutes and chanted for 30 minutes, the director read from a book written by the swami who had begun the ashram. It was a letter from the swami to a follower in Italy. In his letter, he spoke about the necessity of having a vision for one’s ideal life. The swami said that only when you know what your ideal life looks like can you hope to achieve it. I went back to my room and promptly fell asleep. The next morning I woke up early to do some writing. I wrote down some of the comments my friends had made and recorded some of my own observations about life at the ashram. At 6am I went to morning Satsang. After meditation and chanting, it was time for another lesson from the swami. The day’s lesson was about willpower. I was delighted. One of the main reasons I wanted to spend time in the ashram was to test myself against a strict regime, to see whether I had any of this elusive ‘willpower’. The swami reported that the only thing standing in the way of achieving our goals is our own will. Thinking about my own lack of discipline and tendency towards impulsiveness, I felt the swami had me pegged. The director reflected on the swami’s teachings with pragmatism and stated simply that when our thoughts are scattered or focused on the negative, they are not directed towards achieving our goals. I remembered my activities earlier that morning. Despite having planned to diligently reflect on a vision of my ideal life, as prescribed by the swami, I had chosen instead to take notes about other people. My amateur anthropologist act had been a very clever distraction from the main game – my own life. I decided then to mind my own business. For the next two weeks I tried to focus on my own reactions to the structure in the ashram. I listened to my own comments and jotted down some of the more absurd. I paid attention to the way I conducted my tasks at the ashram and came up with theories about myself. I learnt a lot about myself – encouraging and not so encouraging – against the backdrop of the ashram routine. I failed at minding my own business often in the ashram, but if the swami hadn’t put me on track in the beginning, I might have wasted even more time without realising it. When I did my inner Margaret Mead rearing her head and fussing over other people’s business, I calmly redirected my attention back where it belonged.